TurboCAD Deluxe 2019 for Win continues to be the best solution on the market for new 2D/3D CAD users. It's easy to learn and use and offers an incredible collection of 2D drafting, 3D surface modeling, photorealistic rendering, and supported file filters. Over 20 new and improved features have been added in 2019. Excellent File Sharing with AutoCAD 2019 DWG & DXF, SketchUp .SKP, .TAP files for mobile & more. Introduction to TurboCAD, included for free with TurboCAD Deluxe 2019 for Win!This introductory training program is designed for users of TurboCAD Deluxe 2019 for Win and is ideal for anyone who wishes to learn the key concepts of 2D drawing and 3D design from the ground up. No experience necessary! This training program is supplied in a convenient, browser-based format which allows the user to follow each session sequentially or to use as a quick reference. This powerful tool allows users to select any 2D or 3D object type or a Block and then find all occurrences of that in the drawing. Very detailed selections can be made that include parameters such as pen color and style, brush color and style, layer, even the selected object's coordinate system. A great tool to use in conjunction with making further global changes to that selected object. The 'Overkill' tool removes overlapping lines, arcs, text and dimensions, thereby allowing you to simplify drawings by removing duplicate, redundant Entities. Event viewer shows the count of objects that were changed. A new Property have been added to the Flange Sheet tool – Draft Angle. Also, several new options have been added to the Inspector bar when using this tool - Start and End Offset, Start and End Angle. Improvements have also been made to the Unbend tool – accuracy improvements to the Unbend and the ability track progress of this ACIS® operation and interrupt it if desired results are not seen. Data collection of IFC files has been improved, the BIM Palette now shows the BIM file structure, and the BIM tool and BIM Palette's UI's have now been more tightly integrated, making these architectural modeling parts of TurboCAD easier to use. Isolate and Hide Objects - This terrific new feature allows you to take a complex drawing and to quickly reduce its complexity by allowing you to select certain entities and to isolate them independent of layers or groups. In this way you can focus on the entities that you're wishing to edit while avoiding overlapping or otherwise complicated entities. In addition to isolating certain objects you also have the choice of hiding additional objects so that you can focus only on the entities that are important during the editing procedure. When complete you can simply hit the Unhide option and the drawing will return to its previous state. Complete Set of 2D/3D Drafting, Design, and Modeling Tools - TurboCAD® employs a large selection of line, arc, curve, spline tools, and other expected tools, so that no matter the situation you've got access to the right tool for the job. When used with TurboCAD® snaps, modification tools, and drawing aids you will be able to quickly draft and document your designs. Flexible User Interface - Turn on and off only the tools you want to see as you work in a familiar, windows-like, customizable interface. Display TurboCAD's comprehensive set of 2D/3D design tools with full explanations in the beginner mode. Switch to intermediate or expert mode to gain screen space as you become more familiar with the program. Page Set Up Wizard - Breeze through questions designed to help you define your drawing's size and orientation, units of measurement, printing scale and viewpoints. Intelligent Walls - Self-healing walls automatically join and intersect as you design in 2D or 3D. View wall dimensions with a single- click. Automatic Wall Openings - "Slide" doors, windows, arches or any shape to create "openings" in walls with linked 2D and 3D views. Even set vertical alignment properties. Dimensions display as doors and windows are inserted, showing the distance to and from the wall ends for easier, more precise placement. Plus, corresponding offset fields display in the Inspector Bar. 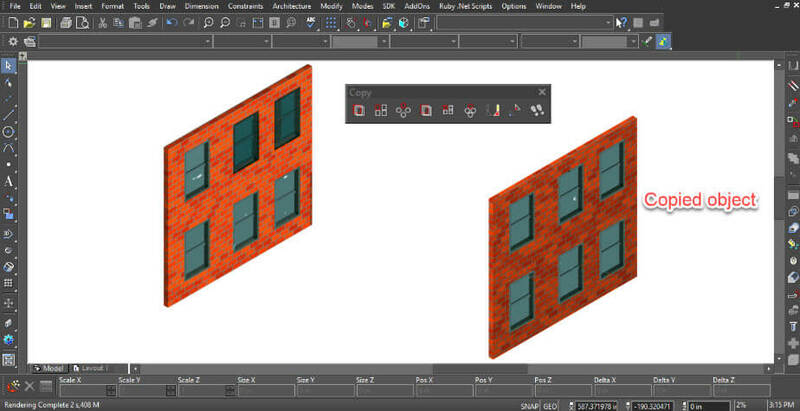 3D Slice - TurboCAD2019 makes it easy to slice, or divide, one or more 3D objects into new objects, by specifying the slicing plane. The 3D slice tool offers the ability to slice by line, by plane, by workplane, by surface, and by facet. Design Director - Organize, access, and explore design alternatives easily in the Design Director Palette. Create layer templates, light templates, camera templates and powerful layers for use on different designs. Layer filters, that are .dwg compatible, help you manage large, complex drawings with ease. TurboCAD Deluxe 2019 layers are AutoCAD®2018 compatible, including a layers dialog based upon 'Design Center'. Improved AutoCAD DWG/DXF Read/Write filters - TurboCAD has always offered excellent compatibility with native AutoCAD 2019 and AutoCAD 2019 LT files. Filter enhancements offers improved file sharing with AutoCAD 2019. Xref Manager - Manage external references (Xrefs) like a parts catalog in your TurboCAD® drawing. Xrefs can also be exported with DWG or DXF drawings for greater AutoCAD 2019 file compatibility. 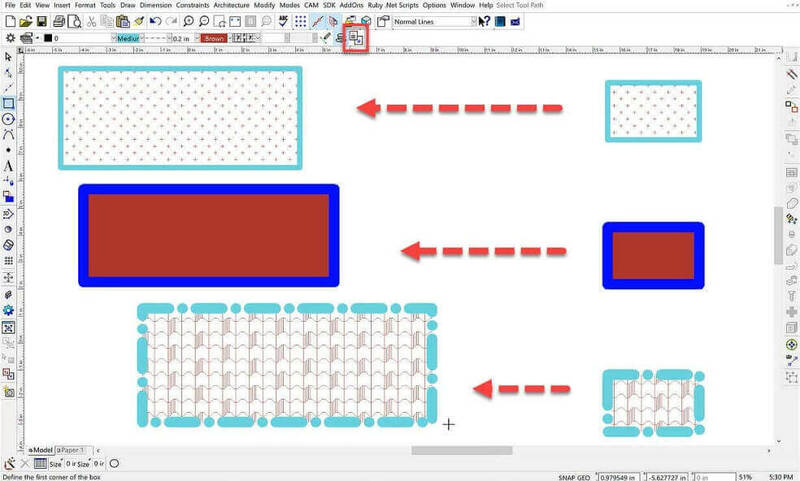 SketchUp SKP Read/Write Filters - TurboCAD 2019 offers both Read and Write file filters based on the latest SketchUp APIs. Import detailed information from your SketchUp model into TurboCAD. Supplemental rendering, lighting and materials information is also imported. You can also convert your TurboCAD models into native SketchUp (.SKP) files for seamless import into Google SketchUp.